I up-cycled a thrifty find by covering its’ large logo with a handwoven “rag” panel. 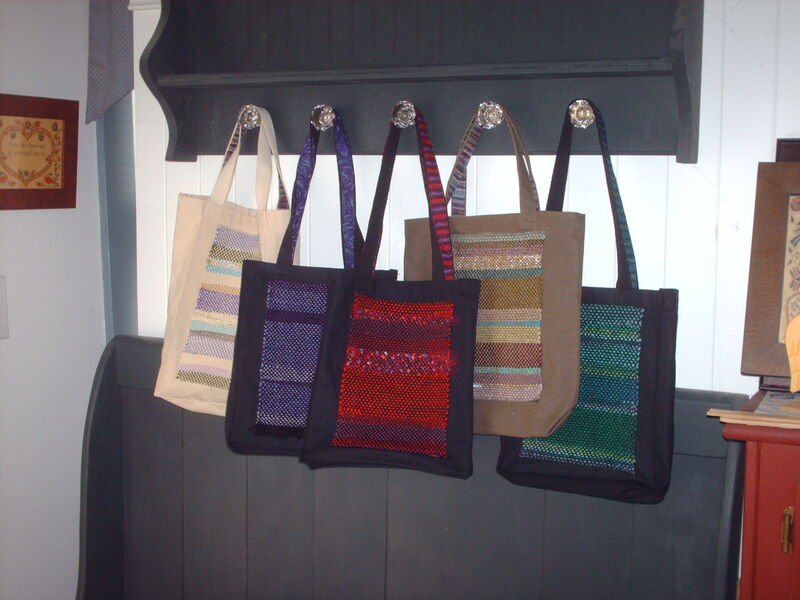 At the time I thought, “What a good project for a beginning weaver!”, as even a first sampler can embellish a small tote. But I never pursued the idea because sewing the handwoven fabric on by machine would not be easy for a novice and hand sewing? ?, well, ugh. . . so much for a quick, fun project! Now that I’m teaching at the Artisan Soul Gallery I am reconsidering this project idea. 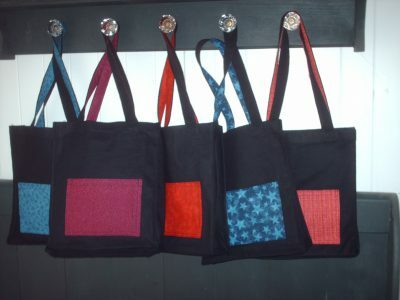 If I can’t figure out a way to simplify things enough for a beginning weaver, I’ll just embellish the totes myself. They would make great gifts for foster children, especially when filled with a few fun treats! I bought two dozen black cotton totes and started to play, pulling fabrics from my quilting stash that coordinate with my scrappy handwoven panels. Note to Self: Choosing a fabric first and weaving a panel to match would be much easier! First I tried lining the shoulder straps on a tote. Easy-peasy and I enjoy seeing the look of surprise when people notice the colorful strips. 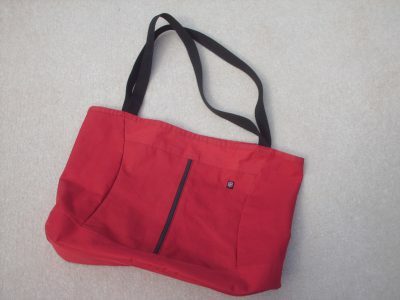 Next I sewed a pocket inside, like on the red tote. I had to make the pocket small so the stitching on the outside of the bag will be covered by the woven panel. Boy, I’d forgotten how difficult/frustrating sewing something to a finished tote could be, even when using a machine with a free-arm. 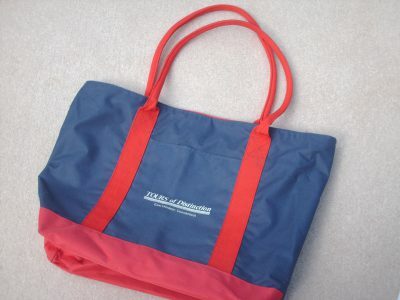 – sigh – I thought this step would be easier with an all-cotton tote than it had been on the red tote which is nylon? with a rather stiff rubbery-feeling lining, but no. Decided, considering the effort involved, there simply isn’t enough benefit gained from adding a cute little interior pocket. 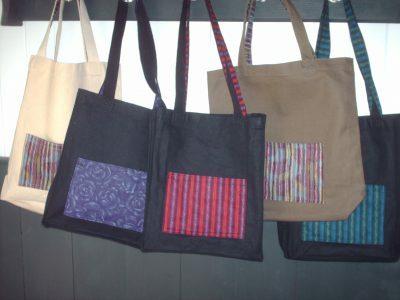 Maybe the totes will be happy with only a handwoven panel and contrast straps? – sigh – Nice, but. . .
How about a larger pocket on the outside? Still not the easiest thing to sew, but at least now I’ll get more bang for my buck, so to speak. A large pocket on the back is much more obvious than a little one tucked inside. After struggling to attach a few handwoven panels – this is supposed to be fun?! – I set my brain on “ponder” for a couple of days. 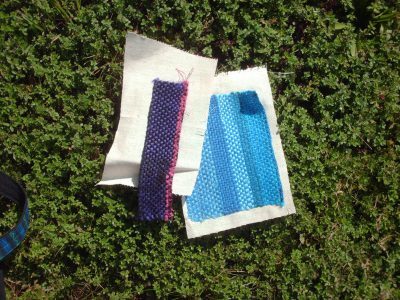 Would the heat required to melt fusible webbing also melt the acrylic and polyester yarns in my weaving? There was only one way to find out. 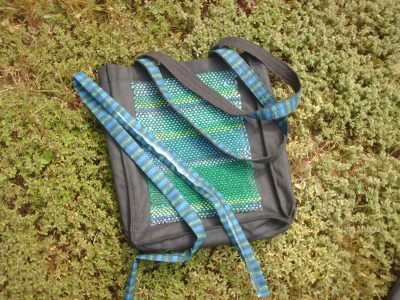 . .
I’m sure other brands of iron and fusible would differ but, I got the best results when I set my iron at the low edge of its’ wool setting, spritzed the front of the tote with water and used a WET pressing cloth. The upper right-hand corner is curled up on the bright blue one because I wanted to find out how much force it would take to pull off a fused weaving. The answer is LOTS! – lol. – This will not happen accidentally. The cream and khaki totes, #s 6 & 9, I found at Savers, like-new – $1.00 each. Took these first ten to Fiber Night to show Laura. Having shared my story of frustration over the little interior pockets, Laura gave me a very good idea. 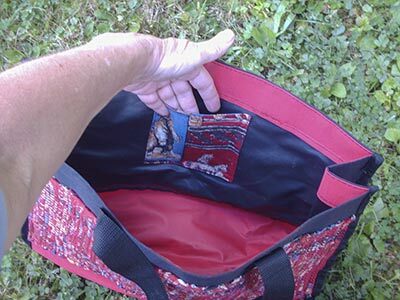 . . sew down only the interior pocket’s upper edge, so it hangs down like a pouch. And I can hide the machine stitching in the seam, where the band at the top edge of the tote meets the body. 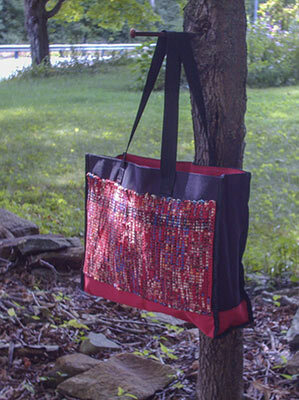 Next I’m going to try fusing a handwoven panel to the front of a rubbery-lined nylon tote, like that old red one. I have three thrifty ones to experiment on. . . Difficult to decide which to do first, as I know it may be ruined in the process. 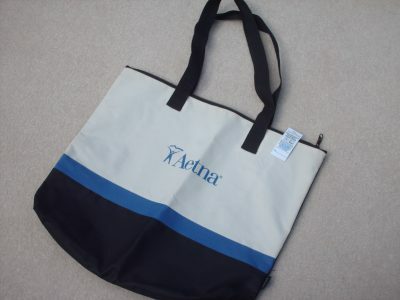 This entry was posted in Bags, Sewing, Weaving and tagged tote bags. Bookmark the permalink. You figured out what I was going to suggest; a hanging pocket. It could span the one entire side….for slipping paper in to keep it straight. Or other sizes. Perhaps add a loop or tab with snap for keys. Of course too many options sewn in, you’ll need to raise the price. I know, so many different features to consider! If I was creating a tote for myself time wouldn’t be an issue and I could include all my favorites. Love these totes! My favorite is the Khaki one #9(?). Good job and very creative! 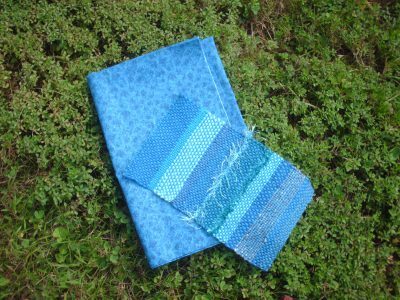 I like #9 too – the colors in the pocket fabric coordinate So Well with my weaving! Not that creative, lol. – The idea came from HERE.